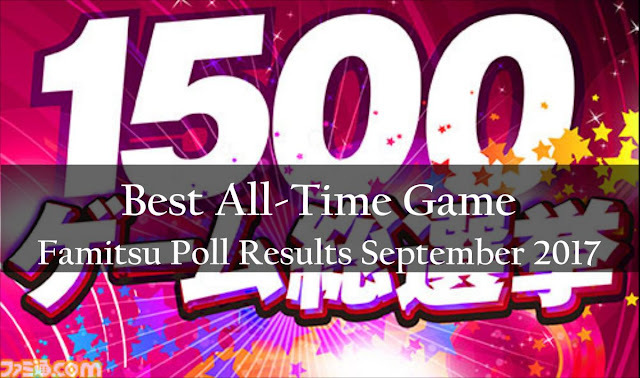 Back in July Famitsu held an online poll for the Best Game of All Time. Although the poll was in Japanese, it was open to global participation and we put up a brief guide to filling it in for English speakers. Vote for up to 3 games, with weightings being 3 points for your first choice, 2 points for your second and 1 point for your third. 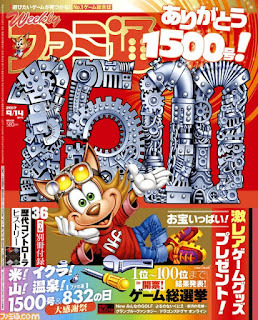 Announcement of the results to be published in the printed edition of the Weekly Famicom magazine's September (and 1500th) edition. 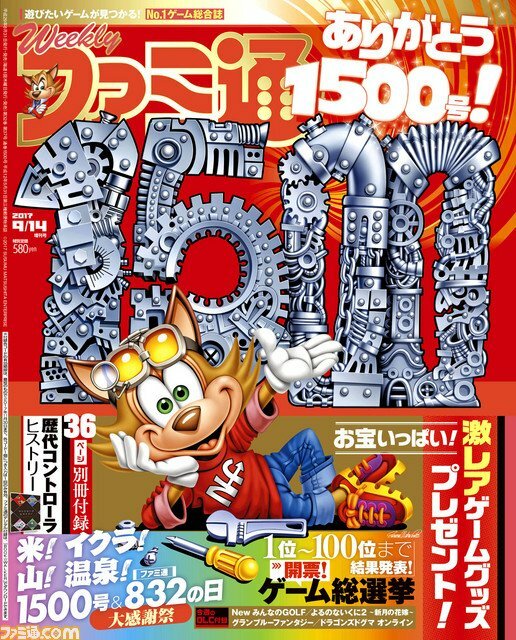 Cover of this month's Weekly Famicom magazine, the 1500th edition. And now the results are out! Without further ado, here is a summary of the rankings for the top 12 titles, as voted by the 5287 people who took part in the poll (the Famitsu magazine article contains an extended ranking table up to 100th place). 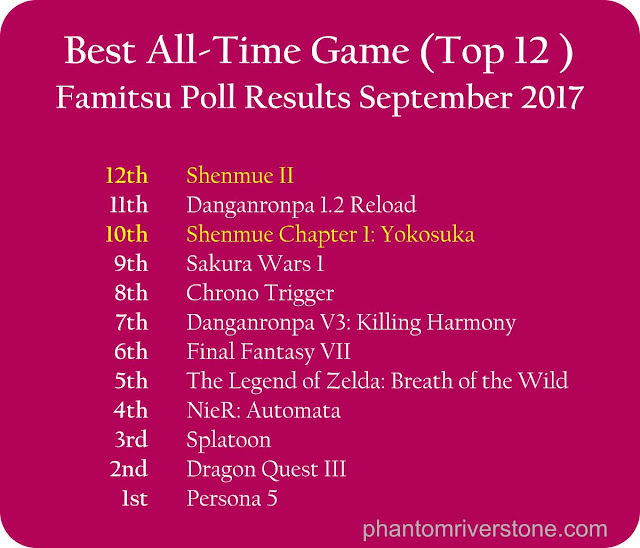 Shenmue II placed 12th, while Shenmue I placed 10th in the rankings for Best All-Time Game - a remarkable outcome considering the competition was across all years and on any type hardware. 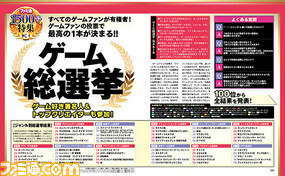 Famitsu commented upon the high level of overseas participation. Of particular note, it was stated that 10% of the votes for Shenmue II came from outside Japan [source: Shenmue Guide blog]. If you were one of the ones to help propel Shenmue up the rankings by taking part in the poll, then congratulations on being part of another fine poll result for the Shenmue series. With this time's poll, unfortunately no messages from the Yu Suzuki or others on behalf of Shenmue were obtained, unlike with the Famitsu's Best Action-Adventure Game poll when Shenmue when Shenmue II rated highly; at that time, messages of thanks were received from Yu Suzuki, Megumi Yasu (the Japanese voice actress for Nozomi) and Masaya Matsukaze (the Japanese voice actor for Ryo) were received. The messages from Yu Suzuki and the others from the previous poll can be read in our June post.